Design company Tata Elxsi has enrolled the first startup for its incubation programme incub@TE. The startup, called Big V Telecom Pvt Ltd, is a tech firm that offers customised business telephony solutions for businesses and consumers. 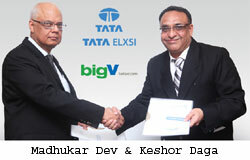 The incubation agreement was signed between Madhukar Dev, MD and CEO of Tata Elxsi and Keshor Daga, MD of Big V on July 22, 2013. "Incub@TE helps startups create sustainable businesses that can scale, by providing them with the required infrastructure, mentoring and market visibility. We welcome Big V into our incubation programme," Dev said. The startup, founded by Daga, has already deployed solutions like Your Own Call Center (YOCC) technology, telephony value added services (VAS), bulk voice calling and SMS gateway solutions. It currently offers around 10 products and services, and is now looking to scale its presence across India and globally. Tata Elxsi launched the incub@TE programme in Bangalore in November 2012. The programme aims at creating the next wave of product and service-oriented technology startups in emerging sectors such as mobile, social, local, enterprise, cloud and embedded applications. The programme also aims to help entrepreneurs take their ideas to the market by providing ready-to-use infrastructure, key technical consulting through in-house experts, mentorship, access to service providers and connections with people and organisations that matter. Tata Elxsi plan to incubate four-five startups a year with an incubation period of 18-24 months. Of late, startup incubators and accelerators have been cropping up across the country. Most recently, Indian Institute of Management (IIM) Calcutta announced that it is planning to set up an incubation centre that will focus on social enterprises addressing the problems of people living at the bottom of the pyramid. Earlier this month, Indian Angel Network (IAN), a national network of angel investors investing in startups and early-stage ventures, formed a sub-group called IAN Impact, which will also focus on social enterprises addressing the problems of people living at the bottom of the pyramid.